Melbourne. 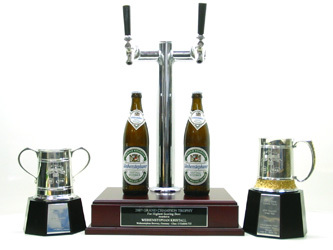 – If further proof were needed that Bavarian beers are among the very best in the world, then such proof has now been definitely provided : on April 19, 2007 the Bavarian State Brewery‘s ‘Kristall‘ was awarded the overall first price at the Australian International Beer Award 2007. Thus the brewers north of Munich may now vaunt their frothy, sparklingly clear beer as the best beer in the world. Close to 900 different beers produced in 39 countries were tasted in the world‘s second biggest beer competition – the most important being Seattle‘s World Beer Cup. After nine days of tasting, it became clear that the oldest brewery in the world also remains the best. 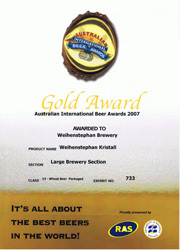 In addition to the overall price, Weihenstephan was also awarded medals for its Wheat Beer, Pils and Lager. No wonder that Dr Josef Schrädler, director of the Bavarian State Brewery Weihenstephan, declares himself particularly satisfied that even in far away Australia the brand is well known and liked. 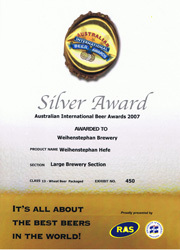 “This speaks for the high quality of our beers”. The Erdinger brewery received a distinction of quite a different nature. With sales of 1.53 million hectolitres, it remains the biggest Wheat Beer brewery. Paulaner, a member of the Spaten Group, ranks in second position. Overall the sales of the 29 major German Wheat Beer breweries grew by 3.4%.